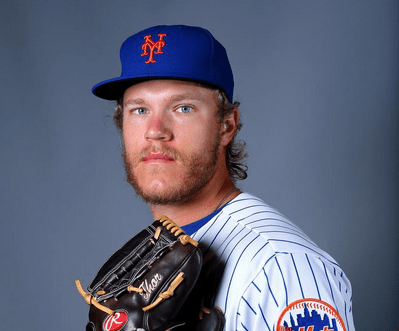 Home / MLB Debut / Happy Noah Syndergaard Day! Syndergaard’s best pitch is his fastball, a mid-90s offering that will get up to 98 with some life. He’s not just a hard thrower, as the young Texan has two above-average offerings to keep hitters off his plus-plus heater. The best of these is his change; it’s a pitch that offers excellent deception from both a velocity difference (typically in the high 70s as compared to the 94-96 mph fastball) and his ability to keep that difference without losing much arm speed. His curveball—a well below-average offering when Syndergaard first entered the big leagues—now flashes plus with hard spin and some depth, and he can either bury the pitch out of the zone or throw it for strikes. It’s the least consistent of the three offerings, and there are times when he’ll “overthrow” the pitch and it will end up in the middle of the zone. And while the stuff alone makes Syndergaard an upper-echelon pitching prospect, what makes him one of the best in baseball is his ability to throw all three of his pitches for strikes. There isn’t much effort to his delivery, which allows him to repeat it on a consistent basis, and though the command isn’t Pedro-esque by any stretch of the imagination, he’s generally within the margin of error and does a good job keeping the ball below the belt. You hope Syndergaard can avoid the arm troubles that seemingly all young pitchers encounter in present day baseball. Hopefully he has a couple years where he’s successful, exciting to watch, and just stays healthy. We’re excited to see what he can do at Wrigley and for the rest of the season.